Living in San Diego affords you a wide variety of tropical landscaping options. In my backyard, I’m lucky to have a Solandra, also known as the Golden Chalice Vine. It grows aggressive, fast and boasts giant golden flowers with 5 popping petals. My Solandra likes to bloom reliably just after sunset, from April throughout the summer. Watching a Golden Chalice Vine bloom is majestic and beautiful — so I had to capture it on video to share. The bloom takes about 5 minutes from the time the blooming begins. The petals each undo themselves until the 5th and final petal seal which when undone, triggers the final and full opening of this jungle vine flower. Watch Solandara, the Golden Chalice Vine bloom on video! You are here: Home » Are You Serious? 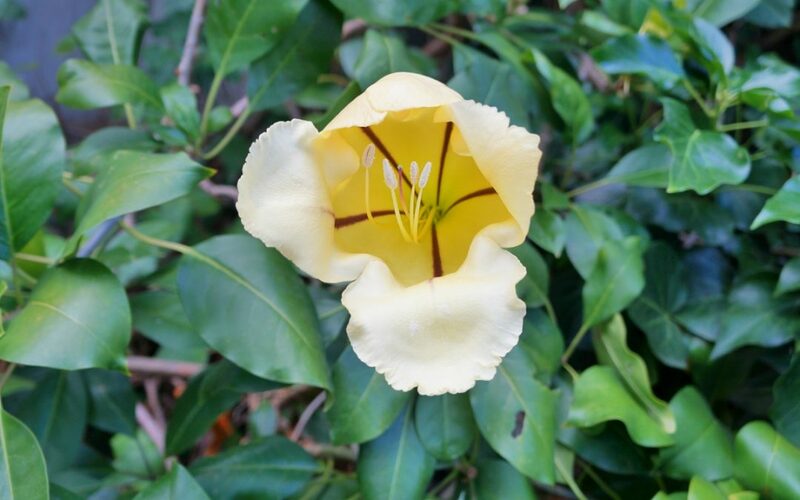 » Watch a blooming Golden Chalice Vine (Cup of Gold) captured on video in San Diego!